Are you using Synergy tools to elevate the way you do business? Dozens of resources are available to you through Pulse, the shopping cart, on your mobile device, on the corporate website, and more. As you continue conducting your business using the Elite Wealth and Elite Health platforms, use all of the tools that have been created for your success. Welcome to Synergy’s new hub for business on the go. Most people carry their phones with them at all times, making it the most convenient place to organize business information. The new Synergy mobile app has dozens of capabilities including 3-way calling, event invites and alerts. This app also acts as a Synergy library storing useful presentations, videos and testimonials that can be easily shared with prospective customer and distributors. Click here to learn more and purchase. The name of this sales tool says it all. The Elite Health and Elite Wealth Pique Interest Cards were designed to prompt their recipients to learn more about Synergy’s opportunities. They easily fit into a pocket, folder or briefcase and provide a space to write contact information for a more detailed follow-up. Make the Elite Health and Elite Wealth tear-off pads the center of every initial Synergy conversation. Each tear-off pad contains 50 one-page presentations that the presenter can “tear off” and give to the prospective customer or Team Member. Bring the tear-off pads to a lunch appointment to make Synergy the focus of any conversation. 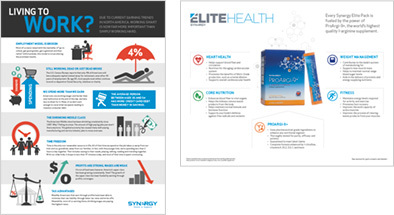 Use the six Elite Health fact sheets to introduce Synergy’s six product categories—ProArgi-9+, Heart Health, Core Nutrition, Weight Management, Fitness, and Personal Care. These fact sheets summarize the benefits of each product within the six products lines and describes the health goals attached to each product line. Fact sheets will make needs-based selling easy! Forgot how to qualify for Elite Honors Club? This worksheet takes the Synergy Team Member through the necessary steps to earn at least $500 in three months. 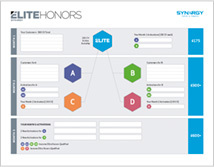 Follow the worksheet instructions to be Elite Honors qualified and earn higher commissions.